The Owyhee River’s headwaters are in Nevada and flows across the southwest corner of Idaho before entering the extremely precipitous canyons of southeastern Oregon. Historians say that the river and nearby town were named in 1826 by Peter Skene Ogden, an explorer for the Hudson Bay Company, after two men in his party who had been killed by hostile American Indians. These men came from the islands of Hawaii, which in those days was spelled phonetically as Owyhee. The colorful environs of the Owyhee alternate from the white, yellow, brown, and red John Day Formation to glistening black bluffs of basalt, brimming with occasional springs and waterfalls. The same erosive forces that have left the spires and temples have exposed myriad fascinating fossils, and have brought agates and other gemstones down to the beaches, creating a rock hound’s paradise. A variety of feathered and furred wildlife, including eagles and egrets, mink and bobcats, pronghorn antelopes, bighorn sheep, and even wild horses inhabit the canyons. We’ll meet at 8:00 PM for a pre-trip meeting at the Riverside Hotel. This is an opportunity to meet your fellow travelers and trip leader, and ask any last-minute questions. Your trip leader will give you a thorough trip orientation, and pass out your waterproof river bags so you can pack your belongings that evening. The trip leader will also confirm the departure time for the following morning. We meet at 7:00 AM for a 3-hour drive southwest into Oregon. En route we’ll stop for fishing licenses and any last-minute items in the town of Jordan Valley. Our launch point is Rome, Oregon. Once through the pastoral Rome Valley, we pass the confluence of Crooked Creek before making camp. We shove off anticipating real whitewater action. We encounter many rapids of various sizes, including Artillery, which we usually stop to scout. The Badlands area begins here, with its interesting clay and sandstone formations. Whistling Bird rapid is the highlight for today. With a difficult hairpin turn against a dramatic cliff face, it’s a certain scout and great photo opportunity. We enter a narrow section of river bounded by precipitous cliffs. Lambert Rocks and Jackson Creek entice us on extended walks up into colorful side canyons and scenic ridgelines. Small hot springs near the river add another interesting geologic dimension. Today there is more excitement with a Class IV chute at the diversion dam. Afterward, we pass Hole in the Ground ranch, a historic remnant of the past. At low water, Birch Creek, a tributary on the right bank, offers road access, which can be used for our take-out. In high water, we travel on to the Owyhee Reservoir, where we have a short motorboat tow to Leslie Gulch. The intensity of the colorful rock formations makes up for the lack of current as we cross the lake. We load up and drive 2.5 hours back to Boise—back to civilization and hot showers. The day before your trip we will meet at 8:00 PM in the lobby of the Riverside Hotel in Boise, Idaho for a pre-trip meeting. Your trip leader will provide a thorough trip orientation and pass out your waterproof bags so you can pack your belongings that evening. The trip leader will also confirm the meeting time for the following morning and give you an opportunity to ask any last-minute questions. 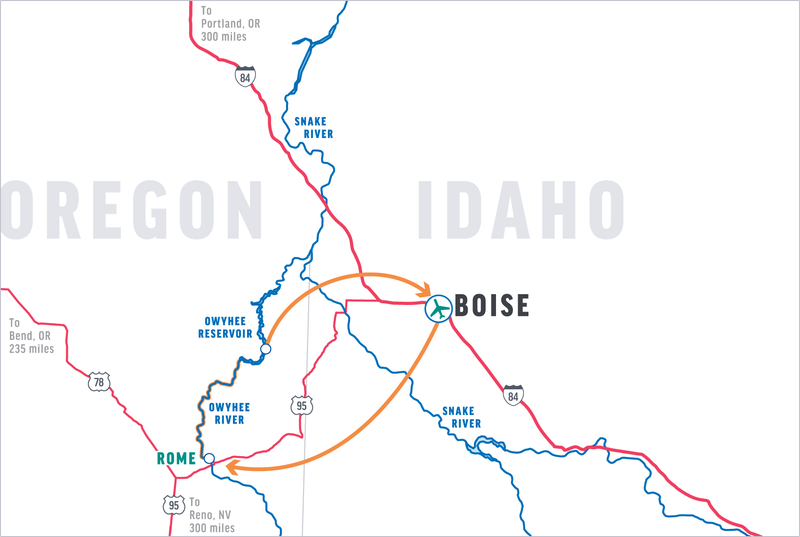 Boise is served by several commercial airlines including United, Delta, Alaska, Southwest, Allegiant, and US Airways. When booking your flights make sure you arrive in Boise the day before your trip starts. When your trip ends, OARS will provide land transportation back to Boise with arrival about 5:00 PM. Plan to spend that night in Boise. If you’re arriving by car, parking is available at the Riverside Hotel. On the final day of your river adventure, you will be returned to the Riverside Hotel in Boise. You should arrive in time to make connecting flights that depart after 7:00 PM, but we highly recommend you overnight in Boise. Please check with the hotel about parking your car and storing luggage, as their policies do change. The water level determine the craft we can take on a given trip. The Owyhee is quite unpredictable: flow rates can vary greatly depending on the snowpack and the weather. It is possible to experience very high and very low flows in the same season. We provide two sodas per person per day, water, lemonade and a limited supply of beer and wine at camp. You are welcome to bring your own favorite beverages, alcoholic or non-alcoholic, in non-glass containers. If you choose to bring additional drinks or alcoholic beverages, please let us know in advance. For those planning to buy hard liquor in Idaho, State Liquor Store hours vary. For information on where you can buy liquor in Idaho, please visit: www.mixblendenjoy.com. Selection is likely to be limited. For your safety and the safety of others, the consumption of alcoholic beverages is limited to camp. The Owyhee has many great hiking trails. While we generally plan at least two guided hikes on each trip, there is ample opportunity for the curious to explore the area at length. Please let your trip leader know if you are an avid hiker and remember to bring extra water bottles and good shoes. Remember however, that all hikes are optional and you can choose to lie on the beach and take in a few tanning rays or read a book instead. Owyhee River fishing is really limited since we are there only during the spring high-water runoff. When the water clears and drops to lower levels, you can fish for smallmouth bass. You’ll need to bring your own gear. We recommend collapsible poles for ease in packing, light spinning tackle with 4- to 6-pound test, and an assortment of spinning lures such as Mepps, Rooster tails, and Super-dupers. Please bring your rod protected in a hard case. Fishing folk can buy an Oregon fishing license when we stop in Jordan Valley on the way from Boise to the launch site in Rome. Bathing is not allowed in the river or in any of the side streams that feed into the rivers. You may want to bring a solar shower or you can borrow a bailing bucket from one of the rafts to rinse off after soaping up. Both are to be used at least 200 feet away from the water source in an area that will absorb the runoff. We recommend using a liquid biodegradable soap such as Campsuds or Dr. Bronner’s www.drbronner.com which can be purchased in most stores that have a camping section and can also be used to wash clothes. You may also find a good selection at your local health food store. Disposable anti-bacterial towelettes (Coleman Swash Cloths, baby wipes, etc.) can also be purchased and are especially convenient for spring trips. You may want to check one week prior to your trip for an up-to-date weather forecast. We recommend the following website: www.wunderground.com for weather in Boise, ID, and Rome, OR. April & May Trips: These are surely some of the most beautiful months to be on the Owyhee River, but they can also produce some surprisingly chilly times. During the spring, the sun is not far enough north in the sky for its warming rays to reach down into the river canyon for as many hours a day as it does in the summer. This means more shady areas, fewer sunny ones. Therefore, when you are splashed (drenched) going through the rapids and you’re in a shady area, you will get very cold unless you are prepared. At the pre-trip meeting each person will be given two large waterproof bags (approximate sealed size: 13” diameter x 25” tall; 3318 cu in; 54.4 L) (approximate sealed size 20” tall x 14” diameter; 3079 cu in; 50.4 L). One bag will be for your clothing and personal items. The second bag will be for your sleeping gear (sleeping bag, sleeping pad, ground tarp, sheet and pillow). These two bags will essentially be your “checked luggage” and will only be accessible in camp. Tents are stowed separately. Please note: if you rent our sleep kit, it will come already packed in one of the two waterproof bags issued to each passenger. We also provide a small waterproof bag per person for day use, where you can keep items such as raingear, camera, sunscreen, lip balm, etc. (approximate sealed size: 17” tall x 9” diameter; 1081 cu in; 17.7 L). The bags are cylindrical in shape and pack from the top. Please pack light, and keep in mind that river attire is casual: comfort, convenience and boat space take precedence over style. At the end of the trip, you will return to Salmon with your waterproof bags, where you will be able to unpack your gear before your trip home. Under most circumstances, if you are of an adventurous spirit and in reasonably good health, you should have no problem enjoying an O.A.R.S. Dories, Inc. People with medical conditions, including pregnancy, should have a physician’s approval before taking an adventure travel trip.